I once left my 5 yo daughter in the car while getting a prescription. I could see the car clearly through the wide window and was watching from the door when somebody hit my car. It wasn’t a terrible accident, just a bump but it could have been worse. If I hadn’t been watching, I wouldn’t have been there to control her response to the insident. To comfort her crying. There’s a difference between leaving a child and a baby. When you leave a child, your developing their sense of Independence. With a baby who is completely helpless without you comma, it’s just too dangerous. There was an article published about England being the strictest country in Europe with respect to not allowing freedom of movement in children. This is supposed to delay development in kids as they don’t learn to fend for themselves. We do need to start trusting our community with our children, allowing them to become responsible people however it’s not worth the risk leaving a baby as if something happens to them you would have a hard time living with it. Economics play a part. Petrol stations need direct observation of the pumps. If you only pay for the fuel, your vehicle will be in your sight every second. At the other extreme, you can’t just duck into a supermarket. They are laid out to prevent exactly that. (It is no coincidence that the milk is at the back, and the quickest route from the busiest door usually takes you past confectionary. ). On the best day, it will be at least 5 minutes in which absolutely anything could happen to the kids and you wouldn’t have a clue. More realistically, at least 10 – 15 min. A corner shop trip from home may be safer but still leaves a long time in which something could happen. I would not do it myself, but can understand someone making the call. The law in QLD prohibits leaving any child under 12 unattended. It is unrealistic and enforcement is patchy. One woman was charged for leaving a 3 yo with a 10 yo while she was in the supermarket for about 15 min. Another was charged for going 300 m down the road to get milk. Her dad lived over the road and was keeping and eye on the house. 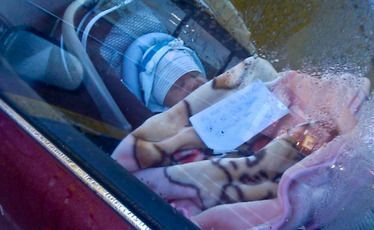 Thought provoking post… I struggle to leave my child in the car at a gas station and would rather skip the trip just imagining what if someone tried to steal my car. I hadn’t event considered people leaving their child at home to run an errand until my friend left her napping daughter to go pick up another child from school in the neighborhood. The first thought that came to me was what if a radical emergency happened like the house catching on fire and you weren’t even there? I am comfortable with going out in the yard while my child naps, and if I had a grocery store downstairs I would really take advantage of that. I guess the line I draw is not going outside of running distance to my daughter. I think “running distance” is a pretty good measure of a safe limit!